1. CCE Almost There Fair - May 12th, 4-7pm at Cedar Creek Elementary School, located at 5582 FM 535 in Cedar Creek. Games, bungee trampoline, bounce houses, choir performances, silent auction, themed gift baskets raffle, concessions, and more! 2. "You're a Good Man Charlie Brown" - May 12th & 13th, 7:30pm at Playhouse Smithville, located at 110 Main Street in Smithville. You'll meet beloved character Charlie Brown and his friends Snoopy, Lucy, Schroeder, Linus, and more! $15/person. 3. 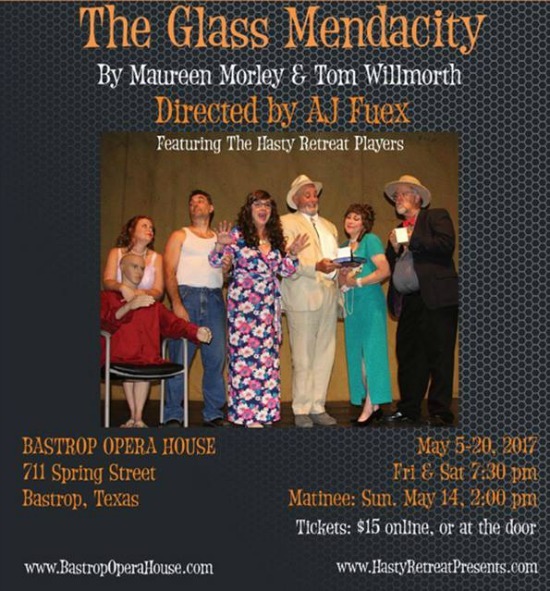 "The Glass Mendacity" **FEATURED EVENT** - May 12th & 13th, 7:30pm and May 14th, 2pm at the Bastrop Opera House, located at 711 Spring Street in Bastrop. A raucous funhouse parody of Tennesee Williams' most memorable plays and outrageous characters! Directed by AJ Fuex and featuring the Hasty Retreat Players. $15/person; purchase tickets online here. 4. Bastrop County Veterans' Benefit Fair - May 13th, 8am-12pm at the Bastrop County Courthouse Annex, located at 804 Pecan Street in Bastrop. Veterans, active duty, reserve and National Guard military members and their families are invited to attend. You may be eligible for health benefits, disability compensation, pension, education, survivor's benefits, loan guarantees and more. Admission is FREE! 5. Pine Street Market Days - May 13th, 9am-5pm on Pine Street (between Water and Main) in downtown Bastrop. There are lots of great vendors - antiques, unique handcrafted items and gifts, pottery, woodcraft, beautiful jewelry, clothing, candles, cute bows and tutus, and so much more! Admission is FREE! 6. Airport Fly-In - May 13th, 10am-2pm at the 84R Smithville Crawford Municipal Airport, located at 789 Hwy 95 in Smithville. Loads of cool planes, helicopter candy drop for the kids at 11:15am, helicopter rides ($20/person), FREE Young Eagles Ground School Training (ages 8-17), airplane beauty contest, food trucks, door prizes, and more! Admission is FREE! 7. Pot Paint and Plant Mother's Day Gift - May 13th, 1:00-2:30pm at the Sugar Shack, located at 114 Loop 150 E in Bastrop. Come and go event for kids to make a special gift for mom. $5.00/child includes small pot, paint, and plant. 8. Read with a Ranger & Backyard Bass - May 13th, 2:00-3:30pm at Bastrop State Park. Join Ranger Kristen for a short story time where she'll read "McElligot's Pool" by Dr. Seuss, and then learn to fish like the boy in the story! Free after park entry fees. 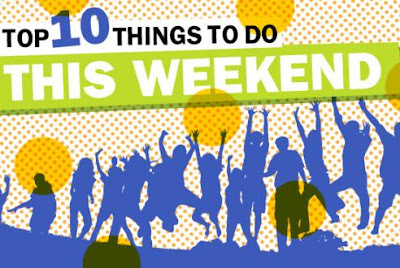 For more Bastrop State Park events, click here. For more Buescher State Park events, click here. 9. Dinner with the Mad Hatter & Brunch Buffet Dinner Theater - May 13th, 5-11pm & May 14th, 12-4pm at Scream Hollow Wicked Halloween Park, located at 149 Split Rail Road in Smithville. Hosted by the Secret Supper Club. Whimsical, delicious food and treats with vegan-friendly options, cash bar, live music, canvas paint party, and more! Purchase tickets here. 10. Cotton Bowl Speedway Racing - May 13th, 6:30-10:30pm at Cotton Bowl Speedway, located at 1175 CR 202 in Paige. Live music from 5:00-6:30pm! General Admission: $12/Adult, $10/Military, Seniors, & Students $5/Child ages 6-12, Children 5 & under FREE; Pit Pass Admission: $30/person.